This is one of the thickest trading cards I've ever come across. It's about 5/8ths of an inch thick, and would probably take a 300 pt holder to house it. 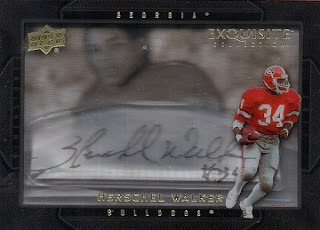 I looked it up, and apparently the athlete signs on a plastic sheet, which is then sandwiched between the front and the back of the card. I like it, but the autograph seems a little muddy with this process. 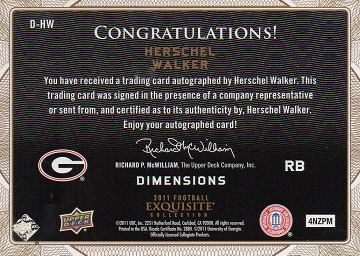 As I am pretty much a Herschel collector exclusively, I don't always know what I'm going to get when I purchase a card. By that I mean, I only want as many different cards of Walker as possible, and I'm not always familiar with how a card looks from a particular set. In this case, I was surprised by how thick it was. With cards this thick, storage is an issue. Even my toploader binder, which I reviewed earlier on this blog, won't come close to holding it. Right now, it's in a plastic case designed to hold several loose cards. I may buy a large magnetic holder down the road. My next post will feature a similarly thick card from 2012.